One of the most unique ideas for a video game was released in March 2002. Kingdom Hearts was a strange combination of Final Fantasy and Disney, a game where Huey, Dewey, and Louie could have a shop right next to moogles. 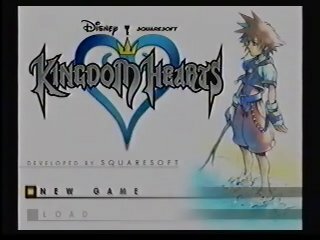 The story starts off when Sora, chosen by the keyblade, goes to A Whole New World. It turns out that no one can Wish Upon a Star, because they're all disappearing, so Sora sets off with Donald and Goofy to solve this mystery. Along the way, Sora learns to Be A Man and to Go The Distance. Unfortunately, he never gets to Kiss The Girl, Kairi, and instead tells her You'll Be In My Heart. She's left hoping that Someday Her Prince Will Come back, an obvious setup for the sequel. Best time: Single-segment 5:33:35 by Daniel 'Sonicshadowsilver2' Tipton on 2013-06-24.